You mean the lowest unemployment rate since 1976 and highest job creation since 2002? I think people will enjoy tat actually. 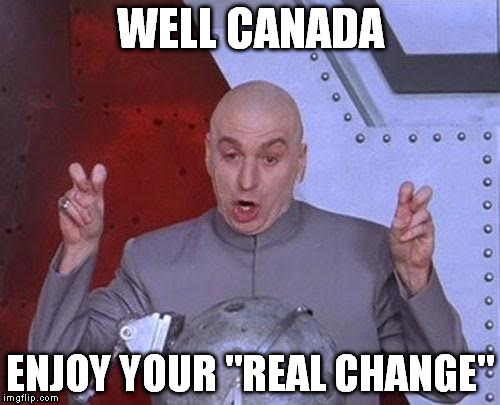 If the Canadian economy under Trudeau is so damned good, explain something to me. Before Trudeau, my bank-managed mutual funds were making money - not a lot but better than bonds. Since Trudeau, those bank managed investments are losing money. Why is that? Banks aren't as smart as you, I guess. Employment gains were concentrated in part-time work (54.9 thousand) while 23.7 thousand full-time jobs were added. That's 55,000 of 79,000 that were part-time jobs. And here's one I'm not sure of, but I seem to remember reading about when Obama was using that and other tricks of arithmetic to make it look like more people were working while more people were leaving the workforce and record numbers were on food stamps. They were saying Part-time jobs didn't use to be computed into unemployment stats, but now they were. Are suggesting that the Prime Minister of Canada controls the stock market? I thought you Trumpers claimed to be anti-wall street and about the working class, yet here you are trying to claim that employment rates and job creation don’t matter, only stock returns count? You’re really grasping at straws. The Canadian dollar rose sharply on the jobs news, gaining almost three-quarters of a cent to change hands at 80.74 cents U.S. shortly after the numbers came out at 8:30 a.m. Eastern time on Friday. The strength of the report also prompted investors to peg the odds of an interest rate hike by the Bank of Canada later in January at about 70%, up from 50% previously. December's jobs figures bring a close to the economic data for Canada in 2017, which ended up being Canada's best year for job creation since 2002, with a total of 423,000 jobs added during the year. Most of the new jobs in December were part-time, but for the year as a whole, the vast majority — 394,000 jobs — were in full-time work. There was also encouraging news about Canadian wages in December. Average hourly earnings in Canada climbed 2.7% in December from the previous year, and wage gains for permanent employees accelerated to 2.9% from 2.7% in November. 23.7 thousand full-time jobs were added. And of that 23,700 22,000 were government jobs. Up 85,500 in the past year alone. The trade deficit also jumped almost a billion dollars from $1.6 billion to $2.5 billion. A shocking new report quietly released by the federal government admits that their finances could collapse in the coming decades if politicians don’t make responsible choices. Two days before Christmas, when most politicians and their staffers had long left their offices for the holiday break, the finance department released — without fanfare or wide notice — a surprising update on long-term economic and fiscal projections. Ian Lee, who teaches at the Sprott School of Business at Carleton University, says Canadians should certainly be worried about these numbers. The forecast also assumes that the budget won’t be balanced until 2055. Projections show it peaking at $38.8 billion in 2035. This goes against a key Liberal campaign promise. During the 2015 election, Justin Trudeau pledged to balance the budget before the next election, in 2019. Yet, in the fall fiscal update announced this past November, Trudeau’s Liberal government pushed the goal posts back and projected deficits until 2021 and beyond. These new assumptions from the finance department now call all of the Liberal government’s numbers into question. This is not the only alarming figure revealed. Another key fiscal promise of the prime minister’s campaign was to bring down the debt-to-GDP ratio to 27% by 2019. Yet the finance report also places this accomplishment out of reach. It instead projects the debt ratio consistently hovering around 31% for the next few years, then dropping to 30.4% by 2021. Federal debt is also assumed to cross the $1 trillion mark around 2031. It is currently $635 billion. These alarming forecasts are the result of the report’s authors factoring in Canada’s ageing population into its financial outlook. Over the coming decades, an increasing number of baby boomers will move into retirement while relying on fewer workers in younger cohorts to bankroll government services. The report is not all doom and gloom, though. It acknowledges there are upsides should growth improve and points out that government could make financially-sound choices to send the numbers in more optimistic directions. “While no single initiative can guarantee sustainable growth in our prosperity, the potential payoff from acting now in a broad range of policy areas is very large, as measures tend to reinforce themselves over time,” the document advises. Trade deficit is a less important secondary measure of the economy - for example IS has had a trade deficit for decades even in booming economies because wealth creates domestic demand in excess of domestic supply and also feeds demand for exotic luxury goods Government policy only affects trade blance over the long term if at all and usually only through very big acts like NAFTA -type trade agreements It’s not like day to day government turns trade up or down. That’s not what you’re trying to claim it is. it’s an attempt to model what future economiies might look like under different scenarios given expected population growth and aging. There are upside and downside scenarios, typically the Sun focuses on the negative and tries to associate it with Trudeau. And it’s not really possible to know what the economy is going to do a few months from now let alone a few decades from now. And of course all kinds of governments will come and go in the meantime, some will probably be conservative So nothing is carved in stone.